The BAG Programme has been set up in Gia Bac, Vietnam, where it will help to see children through education. Owing to government efforts, children in Gia Bac receive basic schooling at the local school for free. However, this level of education (up till Grade 9) is insufficient for Gia Bac students to qualify for university and obtain a degree that would help pull their families out of generations-old poverty. To do so, children have to be allowed to continue high school in the nearby Di Linh town, whereupon they would begin studying for university entrance exams. Gia Bac families are more often than not too poor to send their children off to school in Di Linh town, and the inadequate schooling they receive in the village leaves them mired in poverty. Some parents thus view education as a burden rather than a privilege, for if their education is not enough to grant them university admission and thus greater employability out of the village, in townships or cities, it makes more economic sense for students to drop out of school to work instead of studying. 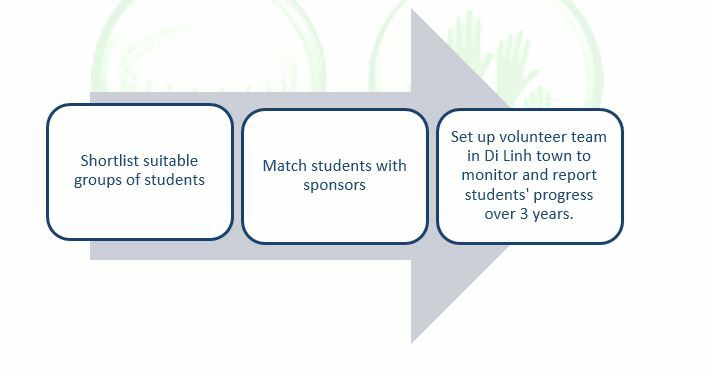 The “Be a Guardian” Programme therefore steps in to empower students with the funds they need to attend school in Di Linh town, thereby helping them secure a brighter future. The presence of such a programme would also alter the attitudes toward education in the village, for parents would be able to view education as a merit rather than a burden. This would allow parents to aspire for further education for their children, creating a conducive learning environment in the village. BAG’s members, in corporation with sponsors, will solve educational issues in Gia Bac village, to help people there have better and brighter future. There are 5 members in Hien’s family, including parents and 4 children . Being the eldest sister, Hien has to bear the responsibility for working on farm, taking care of her siblings, as well as doing housework to help her parents. Her parents hope that their daughter can pursues her studies; however, they cannot afford to support her within 3 year study in Di Linh. According to her teacher, Hien is an industrious and diligent student, she is also aware of important role of studying. She wants to be a tour guide in the future. Receiving the sponsorship will help her bring her dream to reality. There are 6 children in Cuong’s family. Of which, 3 childen still go to school. Two elder and one younger childen quitted their study and went to work. Cuong is the third child. Cuong and Huong, his younger sister, studied at the same grade and just finished secondary school. Their family can afford for only 1 child go to high school and they decided to support for Huong. His father has leg’s hurt so his mother is bread-winner. Cuong’s family has fields for planting corn in 2 seasons per year. So in some period of time, there is no work in fields and they have to work for other employers. Normally, they go to Di Linh town to work about 2 or 3 days/ time. In free time, Cuong also went to work to earn more money for their family. If he receives the scholarship, he will try to study and graduate from high school.